The flow picture largely remained unchanged in the past two weeks, with capital withdrawn from equity funds and plowed into bonds. Total estimated outflows for the two weeks ended September 19 was $7.2 billion, lower compared to the prior two weeks. As usual, equity funds experienced outflows of more than $9.5 million, while bonds saw over $5 billion in inflows. Hybrid funds, which consist of both equities and bonds, experienced outflows of $2.8 billion. Taxable bonds were also in vogue, seeing around $5 billion in inflows. The U.S. and Canada have finally reached a trade deal to replace NAFTA. The new agreement, which also includes Mexico, governs more than $1 trillion in trade and will last 16 years. The deal will be reviewed every six years. The trade dispute between China and the U.S. has escalated, with both countries slapping additional tariffs on each other’s imports. U.S. was first to target $200 billion worth of Chinese imports with a 10% tariff. China struck back, imposing levies on $60 billion U.S. imports. The U.S. Federal Reserve has increased interest rates to 2.25%, in a widely expected move. The U.S. central bank exacerbated confidence in the economy and indicated another hike was possible this year, followed by three additional ones in 2019. Bank of Japan, meanwhile, kept its monetary policy steady, as expected, and committed to keeping interest rates low for a long period of time. Check out our previous edition of scorecard here. International equities (VGTSX) and technology stocks (NASDX) were the only assets that recorded positive performance over the past two weeks, up 1.34% and 0.91%, respectively. Meanwhile, the U.S. market shed some gains these past two weeks, with the overall market (VTSMX) falling 0.40%. 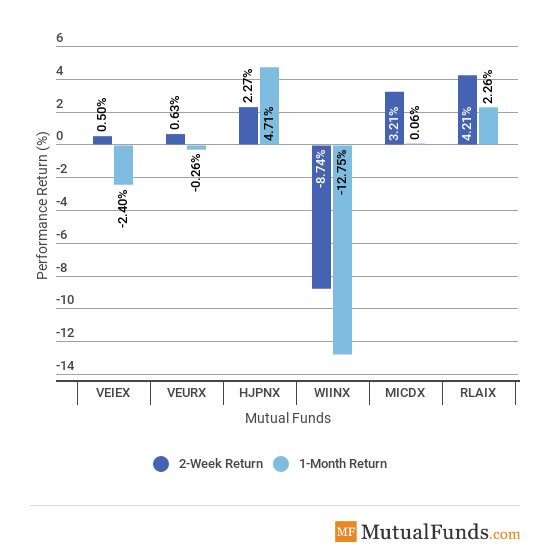 The S&P 500 (VFINX) remains the only gainer for the rolling month, up 0.13%. 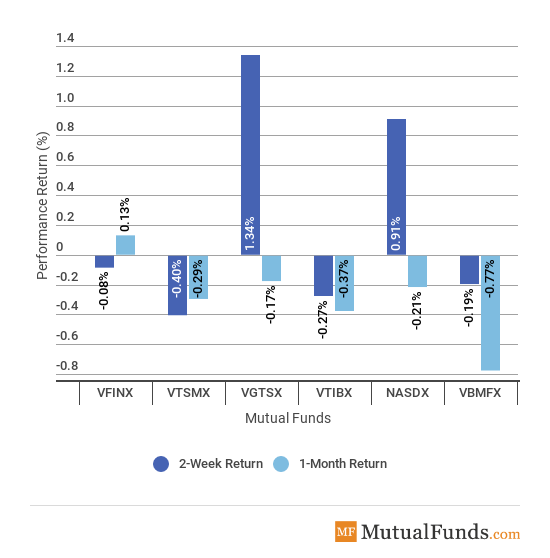 Likely as a consequence of rising interest rates, overall bond market (VBMFX) were the worst performers for the rolling month, declining 0.77% for the past 30 days. The energy sector (VGELX) was the best performer for the past two weeks on strong demand for oil and energy. 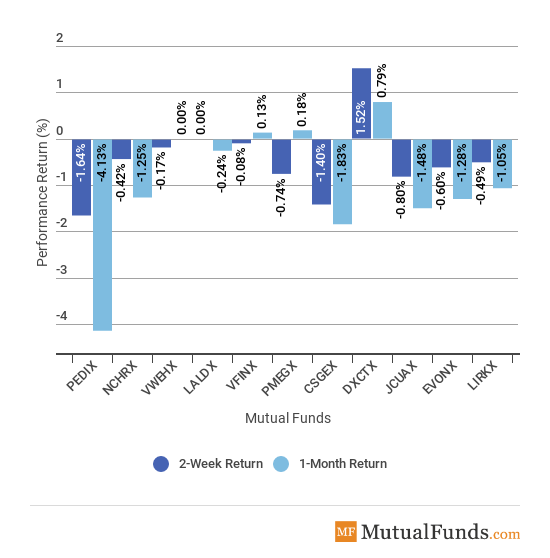 The fund gained as much as 3.59%, propelling it to the top performer status for the rolling month, up 2.86%. The materials sector (FSCHX) dropped 2.80% in the past two weeks, the biggest loss from the pack. Meanwhile, T.Rowe’s global technology benchmark (PGTIX) was the main loser for the month with a decline of more than 6%. Latin America (RLAIX) gained as much as 4.21% for the past two weeks, as investors viewed the battered equities as undervalued. On the other side of the spectrum, India (WIINX) lost more than 8% due to fears of contagion from a potential bankruptcy in its shadow banking sector. Unsurprisingly, India is also the worst performer for the rolling month with double-digit losses. Japanese equities (HJPNX) soared 4.71% in the past 30 days, representing the best performance from the pack. PIMCO’s long-term bonds fund (PEDIX) was the worst performer for the past two weeks, as the Federal Reserve raised interest rates again. Long-term bonds also underperformed for the rolling month, down 4.13%. 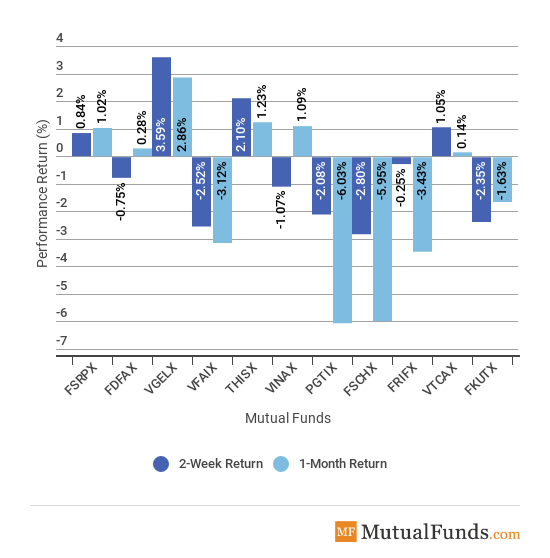 To learnhow rising interest rates can impact mutual funds, read here. The commodities fund (DXCTX) was by far the best performer for the past two weeks, up 1.52%. With a gain of just 0.79%, Direxion’s commodity-focused vehicle is the best performer for the rolling month. International and Latin American equities were favored by investors this fortnight as a few months of poor performance made valuations attractive. The energy sector was buoyant, thanks to strong demand for oil and gas, while long-term bonds suffered as the Federal Reserve raised U.S. interest rates.